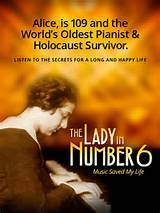 Brief Synopsis – The true life story of a 109 year old Holocaust survivor who attributes her long life to her passion for music. My Take on it – I heard about this movie a few years back and was quite interested in seeing it and was happy to finally get a chance to catch it. It’s such a pleasure to see how this extraordinary woman lived her life by clinging to the beauty of music. The story itself is quite moving and the added stories of a few of Alice’s friends are also interesting and moving to hear. I remember the emotional speech given by the producer Malcolm Clarke upon winning the Oscar award for Best Documentary Short just days after this remarkable woman passed away at the young age of 110. Bottom Line – Great story that I’m glad I finally got to hear. Remarkable woman who died the week before the Oscar win. Very moving stories by Alice and her friends. Highly Recommended!